You can set up a default printer for printing from the Office Manager and other areas throughout Dentrix Enterprise. However, before printing from the Office Manager or other modules, the printer to which you want to print must first be selected. 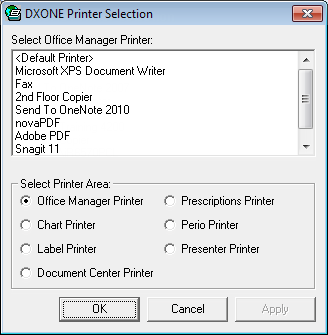 The DXONE Printer Selection dialog box appears. • Office Manager Printer – To print reports from the Office Manager module. • Chart Printer – To print from the Patient Chart module. • Label Printer – To print labels. • Document Center Printer – To print documents from the Document Center module. • Prescriptions – To print prescriptions from the Prescriptions module. • Perio Printer – To print periodontal examinations from the Perio module. • Presenter Printer – To print treatment plan presentations from the Treatment Planer module. 3. In the list box of printers, select the printer that will be used to print from the selected area.